Lewitt have already carved a name for themselves in the studio mic market, but they’re also pushing ahead in the live–sound world. All their mics are designed in Austria and then built in their own factory, located in China, which helps keep the costs under control without compromising on build quality. Most of their models fall into the mid–price range, and in this review I’ll be looking at two hand–held live mics, one dynamic model and one capacitor model. The dynamic MTP 840 DM features switchable sensitivity and a three–position high–pass filter, but most radical is the fact that it has active, low–noise on–board electronics, which you can opt to use or not. When engaged, these are powered from standard phantom power. In active mode the frequency curve is shaped for studio vocals. Its super–cardioid capsule, which sits on an isolating suspension, is designed to have a good transient response, while the protective basket assembly doubles as a pop/wind shield. The designers claim that the capsule also maintains a more consistent directivity across the audio frequency range than most dynamic models, which helps mitigate the effects of tonal change when the mic is moved off–axis and also helps increase the feedback threshold. The frequency response extends from 40Hz to 18kHz, which is pushing the limits for a moving–coil microphone, and the quoted sensitivity is 3.5mV/Pa (–49dBV) in passive mode or either 7 or 14 mV/Pa (–43dBV and –37dBV) in active mode. In its active mode, the mic is re-voiced for studio work and offers a dynamic range of 121dB(A) with an EIN figure of 19dB(A). A signal–to–noise ratio of 75dB(A) is quoted, and the maximum SPL is 140dB, depending on the gain setting. The amplifier gain can be set to 0, 6 or 12 dB, while the three high–pass filter settings (off or 12dB/octave at 150Hz or 250Hz) help balance the proximity effect. 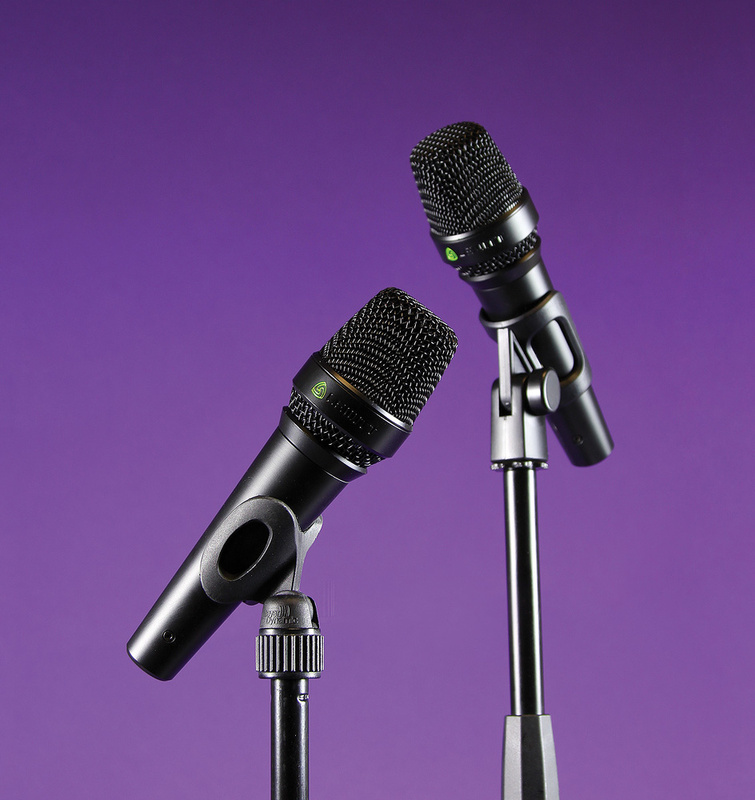 Physically, the mic is fairly conventional in appearance and feel with a substantial die–cast metal body and a hardened steel mesh basket, both of which are finished in satin black. The XLR pins are gold–plated to prevent corrosion. The mic is 51mm in diameter at the widest point on the basket, its length is 183mm and its weight is a comfortable 336g. As supplied, the mic comes with a standmount, a foam wind shield and a storage bag. All the user settings are made using four recessed slide switches that are accessed by unscrewing the basket. You need some kind of pointed device such as a small screwdriver to access these, but this strategy offers absolute protection against someone changing the settings during a performance. The switches are all labelled, though you may need your reading glasses. Tiny LED indicators (which can be turned off if not appropriate) make it easy to check you have the correct setting when working on a dimly lit stage. In its passive mode the MTP 840 DM is actually quite bright sounding, which is no bad thing in a live environment as it helps cut through the back line, though it can sound a touch sibilant with some voices. Of course you can always roll off a little top on the desk if it sounds too bright. The key point in this mode is that there’s bags of clarity and the lows have been rolled back to allow you to work very close to the mic without being overwhelmed by the proximity effect. Though the active option is voiced for studio use, it makes a useful alternative for live use where a warmer and less cutting sound is required. As you’d expect from the inclusion of active electronics, this mic costs a little more than most typical dynamic models but it is still very reasonably priced for the quality on offer. Cosmetically identical and just a hair lighter at 332g, the MTP 940 CM uses a one–inch-diaphragm true capacitor capsule, so it really can be considered as a studio mic in hand–held form. Here the response covers 20Hz to 20kHz. Again the mic has been designed to minimise the effects of popping and acoustic feedback, which are always a challenge in live sound. With a 135dB dynamic range and a maximum SPL handling of 144dB before engaging the pre–attenuation pads, the direct–coupled circuitry produces a self noise or EIN of just 9dB — better than many dedicated studio mics. Sensitivity is 10mV/Pa (–40dBV) in cardioid mode and standard phantom power is required for operation. The MTP 940 offers three switchable widths of polar pattern: wide cardioid, cardioid and super–cardioid. As with the MTP 840 DM there are three low–cut filter switch settings (this time at 80Hz or 160Hz as well as flat) and three switchable pre–attenuation pad settings. Those familiar Lewitt LEDs show the current settings, and the three slide switches are safely tucked away inside the basket. Lewitt say the mic is aimed at vocalists who want to recreate the sound of their studio mics on stage, but equally the MTP 940 CM can be used in the studio by those vocalists who only give of their best using a hand–held mic. This model comes with the same accessories as the MTP 840 DM. As Lewitt suggest, there’s no reason not to use the MTP 940 CM as a studio mic, either hand–held or standmounted, so if you need one mic that can meet both your live and studio vocal needs, the MTP 940 CM is certainly a contender. While the dynamic MTP 840 DM in its passive mode has many alternatives, there are only a small number of active dynamic competitors, of which one is Blue’s Encore 200. The MTP 940 CM is similarly difficult to place as the only other two multi-pattern hand-held capacitor mics I know of are the Shure KSM9 and the Sennheiser e965. Clean sound with plenty of headroom. These mics cost more than their passive dynamic counterparts, many of which do a perfectly adequate job in a live environment. 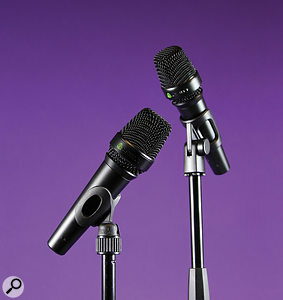 Both mics uphold the Lewitt reputation for quality and innovation, and between the two models (and their switchable options) there’s enough tonal variety to suit just about any voice. MTP 840 DM £209, MTP 940 CM £499. Prices include VAT.